Disclosure: This trip was possible thanks to a partnership with Go RVing. I'll have to be vulnerable here and admit that I never had it in any bucket or wishlist to one day go on an RV trip. I thought it was too complicated, too time-consuming, too expensive and just not my idea of a relaxing vacation. RVs were for retired people that had the time to hit the road and aimlessly explore. I'm so happy all my misconceptions were wildly shattered this summer and I have no problem admitting I was 100% wrong. So wrong, that I want to make sure that if you have any of those misconceptions or stereotypes about the RV life, I can help you change your mind by sharing with you my family's experience. I had the opportunity to partner with GoRVing.com (a #WeAllGrow Summit 2018 sponsor) to borrow a motorhome to take my daughter on an RV adventure this summer, but I was super intimidated to do it alone. Little did I know that my brother in law in El Salvador had always dreamt of taking his family on an RV trip throughout California. As soon as he found out, he begged me to take the collaboration so him, my sister, niece and nephew could join us on a 6-day summer road trip to Yosemite. It was SO perfect since one of the hardest things about living in L.A. (the only one aside from traffic!) is that we have no family here and it's always a bit cost prohibitive for them to visit. This RV trip was the perfect way for us to go on a family adventure together! If the thought of an RV adventure for your family has ever crossed your mind, but you've hesitated to take the plunge, let me share with you just five reasons why I highly recommend you give RVing a go. Renting an RV is much more affordable and easier than you think! The RV we had was a rental from El Monte RV in Newport Beach, CA. Because we were a family of six, the motorhome that best fit our needs was a Class C Family Sleeper. Renting that via El Monte costs you approximately $270 to $350 per night depending on the time of year with summer being high season. You have to add the cost of insurance which you can purchase there or check with your provider if you're covered. The RV includes a generator and a basic starter kit. It can start adding up if you purchase a Personal Convenience or Kitchen kit with sheets, towels, pans, coffee maker, etc. You can also cut down costs by bringing all those items with you. No worries, there's plenty of storage for everything – more on that on #3 below. The other expenses will be gas, food and the campsites. Most overnight RV campgrounds with hookups range from $30 to $75 per night. All in all, for a family of six, the cost of a trip where we'd have to pay for two hotel rooms, flights (if flying), local transportation and eating out is much more expensive than an RV trip where you have all the conveniences and more in natural settings that are just priceless. It's camping upgraded because you're out in nature exploring idyllic sites like Yosemite and then you get to come back to take a shower in your bath, prepare dinner in your kitchen and eat it under the stars next to a picture-perfect campfire. The RV had everything we needed and much more space than we expected. The kitchen was small, as expected, but fully stocked with a microwave, gas stove, oven and sink. The fridge was a very decent size and we had cupboards galore to store all the utensils, dishes and food. My sister and I had no problem preparing all three meals, snacks and cocktails (of course!) in the RV kitchen. We slept really comfortably and each of us in our own beds. My sister and her husband had the master bedroom; my daughter and niece loved sharing the bunk bed. My nephew took the sofa bed and I had the whole overhead loft to myself. It was hot and smoky in Yosemite when we were there due to a massive fire nearby, so we did have to spend a lot of time inside the RV, but the AC kept us cool and with the doors and windows closed to block out the smoke. The bathroom is small but works oh-so-well! We never had issues with hot water or dumping out the grey water. It wasn't our favorite task, but my brother in law became a pro after a few days! All the conveniences from home or a nice hotel, set in the most beautiful locations you can find. We were so lucky we found perfect spots at both campgrounds we stayed in. At the Pismo Coast Village RV Resort in Pismo Beach, we woke up right in front of the Pacific ocean to the sound of the waves and breathtaking views. The kids loved that they could rent bikes to go around the family-friendly resort and we definitely felt that we could rest as it was the perfect one-night pit stop on our way to Yosemite from Los Angeles. At Yosemite Lakes RV Resort we got so lucky because we found a spot right on the Tuolumne River bank. It was just so beautiful, picture perfect and serene. It was also a very convenient spot to explore Yosemite as it's only a bus ride away from the Yosemite Valley Visitor Center and the heart of the national park. There are plenty of ways to find the perfect campground for you. GoRVing has a page where you can search for RV campgrounds and destinations all around the country. 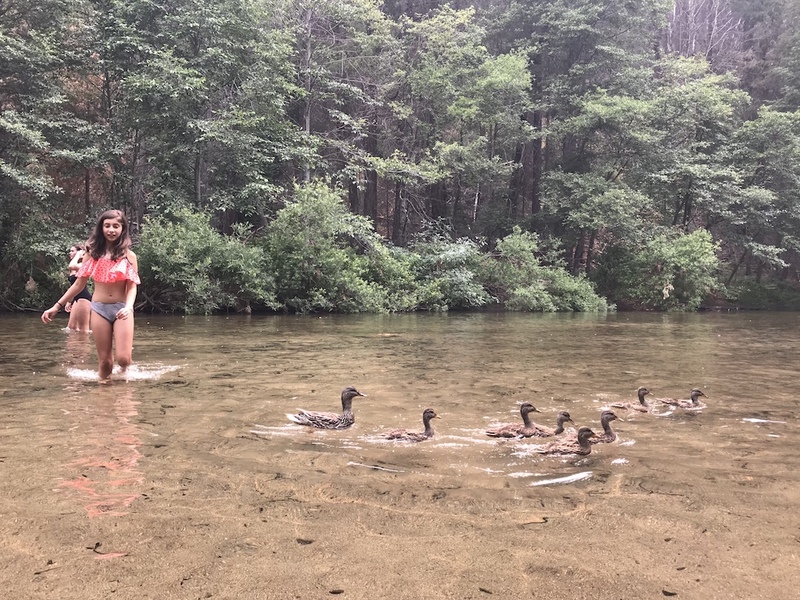 On our first day at Yosemite Lakes, we decided to just stay in the campgrounds to finish setting up, relax and enjoy the beautiful river and hikes at our front door. It was just time to let it all soak in. On our second and third days at Yosemite, we took the Yarts bus to Yosemite Valley. We definitely didn't want to move the RV from the campsite because it would mean having to pack things up and disconnect from electricity and sewage. The downside was that we had to rely on the bus hours (which are limited) and the free shuttles to get around the valley. If you plan this trip, I'd recommend the alternative to take a car with you that you either drive or pull (an additional cost to do that) so you're able to explore at leisure once at your destination, though it can definitely add up the costs and the complications. There was a massive fire burning about 15 miles away from Yosemite Valley, so we had to deal with a lot of smoke and low visibility, which definitely put a damper on most of our plans. 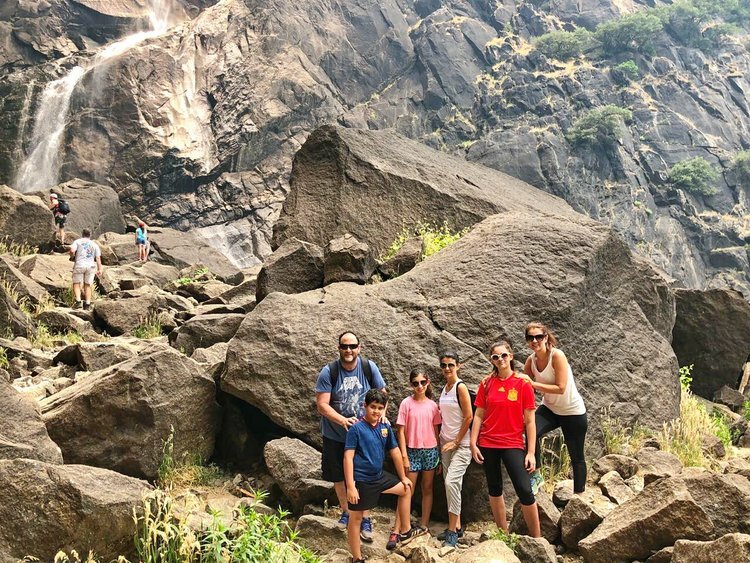 We were still able to go on hikes to mesmerizing waterfalls like Yosemite Falls and Vernal Falls, as well as walk through beautiful meadows all while taking in the massive beauty of this national treasure. The last but most important of all the reasons why you need to plan an RV trip with your family is simply that it's just perfect for families of all sizes. I was able to bring together my sister's family and mine in one trip where we closely bonded amongst nature, road trip sing-a-longs, cooking together, campfire moments, board games, river wading, hikes and long drives with awe-inspiring views. It's definitely a trip none of us will ever forget, but for the kids, it was especially magical to be able to share this experience together and create memories that will surely last us all a lifetime. These Highlights – RV Trip 1 and RV Trip 2 – of the Instagram Stories I shared of our adventure truly capture the joy of our first RVing trip together – the first of many more to come! Thank you to GoRVing for partnering with me to make this unforgettable trip possible. Make sure you make gorving.com your first stop if you're planning your own RV adventure! Now that kids are back-to-school, it's time for parents to get back on the grind of the basic routines that encompass a tween and teen's life. And, yes, learning and sticking too a basic skin care routine is an important habit to develop early on. Whether you're away on vacation, working on the road or simply on a summer weekend getaway with the family, it's important to stay connected. The AT&T Unite Express by NETGEAR is an ultra-sleek mobile hotspot that makes it easy to connect to the Internet while on-the-go. It lets you enjoy secure, reliable, affordable WiFi when you need it. Our #LatinaBloggers share their experiences using this mobile hotspot and all its great features. "Depender de tu celular o del proveedor de Internet de tu casa para tener acceso a wifi sin interrupción es cuestión del pasado. Ahora, puedes estar conectado permanentemente con tu wifi personal o hotspot movíl para el mejoramiento de tu estilo de vida." A Thrifty Dive "No more unneeded hiatus for this blogger. I am zooming through the internet with my new AT&T Unite Express mobile hotspot. Forget having to use only my phone to keep me connected, this baby does it all." "Para mantenernos conectados todo el tiempo, ya sea para buscar un mapa, los restaurantes mas cercanos o para enviarles fotos y vídeos a tus seres amados de lo padrísimo que la estas pasando en tus vacaciones, AT&T Unite Express by NETGEAR te permite disfrutar tu conexión a internet de una manera muy accesible"
"The AT&T Unite Express by NETGEAR was easy and fast to turn on and her laptop was connected in minutes. This allowed me to have a conversation on my phone with a work colleague while my daughter enjoyed watching YouTube videos on her laptop." The AT&T Unite Express gives you secure Internet access via AT&T’s 4G LTE network (where available). For more information follow #LifeConnected or visit their Facebook and Twitter.